Whether it be a birdwatcher or bird photographer, a field guide is a must for anyone exploring the birds of India. 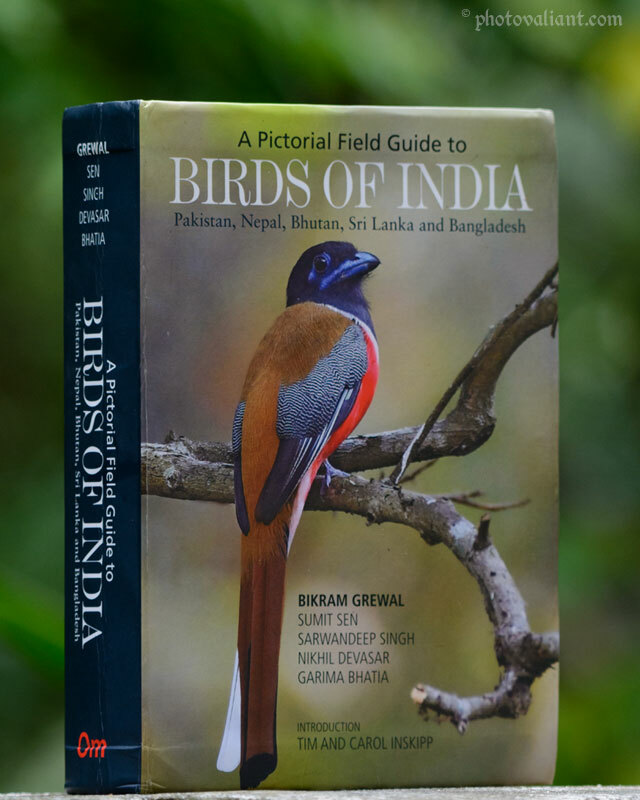 The book – “A Pictorial Field Guide to Birds of India” – can be a good asset if you are looking for one. This article reviews the first edition of the book released in 2016. The authors of this book are among the eminent birders and ornithologists of India. Why consider this book – “Birds of India”? Let us take a look at the details. As the title says, it is a pictorial guide. Instead of diagrams, actual photos are used to illustrate each of the birds. For me, it was the main reason to get this book. Moreover, the quality of these photos is outstanding, thanks to all the photographers who contributed. Multiple photos are used wherever necessary to show plumage variations, flight, and dimorphism. This comprehensive guide contains the details of 1300 species of birds. Also, it covers almost the entire Indian subcontinent, including Nepal, Bhutan, Sri Lanka, Bangladesh, and Pakistan. The details include a brief description, range, size, habitat, and voice of the bird. Along with that, the scientific name, family name and common name are given at the top help for quick identification. The authors have also taken care to note the differences in identification between similar species. The description includes crucial information about a bird’s behavior and appearance. The layout is in such a way that one leaf contains at most four birds. But some birds which show different phases span multiple pages with color photos. Although small in size and not very precise, the distribution maps are useful. Different colors distinguish the resident and migratory ranges of a bird. Anyway, the maps help as a quick reference of the birds’ range, mainly for the endemics. Although the quality of the content is superb, the book has some minute negatives too. The description is brief, not detailed. So if you want a guide with maximum details, this book may not be the choice. The binding is not hard. A field guide is more prone to damage than other books. So it should have been tougher. The map is missing for some rare birds. Sometimes, plates and diagrams are more suitable for identifying similar birds. Price – The MRP is not given anywhere in the book. I bought it from Amazon under 800 INR. I highly recommend this book, especially if you are a photographer looking for a pictorial guide.